With the advent of spring, our skin requires more cleansing and toning. And clay is the simplest component that contains micro elements and vitamins, because with clay you can make a mask for any skin type. How to choose the best base for your DIY clay mask? We have created the ultimate list with 80 DIY clay masks recipes, featuring 8 clay types. The healing properties of clay go back to ancient times and were described in scientific works of Avicenna. For centuries, mankind has used this sedimentary rock for health benefits, because clay therapy is an effective and fast way to get rid of various diseases (check out our article containing detox recipes with bentonite clay). But the use of clay is not limited to medicine. Today, many cosmetic salons offer clients various masks with clay. Depending on its chemical composition, which also results in different color of the clay, the effect on the skin will be different. Today, cosmetic clay of different colors can be found on the shelves of drugstores and online for quite affordable price. So, there is no need to go to the salon to arrange a truly SPA experience at home. Normalizes the production of sebum, therefore improving the condition of oily skin. Silicon in the clay is a real salvation for aging and acne skin. If you have noticed the first signs of aging on your face or are tired of fighting acne, it may be time to get acquainted with DIY clay masks with rejuvenating, tightening, cleansing, drying effects. They are prepared very easily and moreover, they are very affordable. Depending on the various compounds in its composition, clay can be in different colors. Accordingly, its properties and its effects on the skin will vary. After learning about the cosmetic properties of each type of clay, you can choose the color that will help you solve your skin issues. It is not forbidden to combine different colors within the same DIY clay mask. You may have to try more than one remedy until you discover the invaluable beauty formula that will make your skin radiant and youthful. As a starter kit for your DIY clay mask, we suggest to get a set of several clay types, for example, a set of 5 clay powders (Bentonite (Indian Healing), Moroccan (Red), French (Green), Kaolin (White) and Activated Charcoal/Bentonite Clay) from Bare Essentials Living. One of the most popular in cosmetology and for DIY clay masks is white clay. It has pronounced drying properties, so the mask with it is almost ideal for the curing of acne and oily skin. Kaolin tightens pores, removes excess sebum and is famous for its whitening and anti-inflammatory effects. The DIY clay masks prepared on the basis of white clay improve the complexion and give the skin a feeling of freshness. This is the second most popular type of clay (after kaolin), widely used in cosmetology. Blue clay is valued for the fact that it lies in the ground at a sufficiently large depth and therefore is enriched with the most useful substances (microelements and mineral salts, in particular), which then transfers to the skin. The mask with blue clay is used as an anti-inflammatory agent. It treats acne and inflammation very effectively and relatively quickly, heals wounds and microcracks, removes dirt, perfectly tones and improves the complexion. The rejuvenating effect of blue clay makes it possible to use in anti-aging skin care, because blue clay is able to smooth out mimic wrinkles and fine lines. The so-called blue Cambrian clay deserves special attention. It is mined from a depth of more than 40 meters from the surface of the soil; this layer corresponds to the Cambrian era in the history of our planet. Cambrian clay has a rich mineral composition (high content of koolinite, hydromica, chlorite, etc.) This is very important because it has been proven that clay, which contains a complex of microelements, is more effective than the same minerals taken separately. With the help of this Cambrian variety of clay you can lighten freckles and pigmentation. Masks with Cambrian clay activate blood circulation and normalize metabolism. Green clay owes its color to iron oxide in it. It also contains phosphorus, manganese, calcium, cobalt, copper, zinc and aluminum. This clay copes well with cleansing the pores and regulating the work of the sebaceous glands, reduces the severity of rashes. The microelements in it control the hydrobalance of the skin. Therefore, masks with it are recommended to use for people with thin, dry, flaky skin. But it also has a rejuvenating effect, like all other masks made with cosmetic clay: it smoothes wrinkles, tightens the skin, makes it supple and elastic. 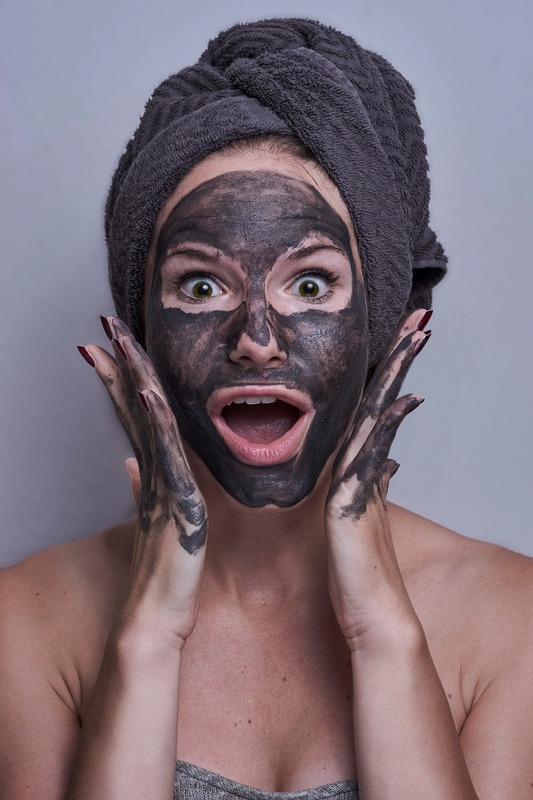 Black clay masks have a pronounced detox effects: they activate the removal of harmful substances, clean the pores to a sufficient depth, remove the dead cells layer. As a result, the skin begins to breathe freely. Microelements contained in black clay (magnesium, strontium, iron, calcium, quartz) act on the skin better than any scrub. Red clay is often undeservedly forgotten in cosmetology. DIY clay masks with it are not less effective in terms of anti-aging properties. The uniqueness of red clay, which distinguishes it from other varieties, is that it can perfectly care for the most delicate, sensitive and irritated skin. It soothes, relieves stress, eliminates inflammation. Red clay contains compounds of the hematite mineral, alumino-strand compounds of magnesium, iron, potassium, copper. Red clay relieves allergies and irritation, and therefore is most suitable for sensitive skin prone to frequent redness. Pink clay is one of the most neutral varieties of this amazing substance. With a slight lifting effect, it will perfectly care for normal skin type (or combination skin). Pink clay face masks are suitable for normal skin type, which from time to time you need to nourish and moisturize. DIY masks with pink clay are a golden mean: nourish a little, slightly moisturize, moderately cleanse and rejuvenate enough. This clay is used quite rarely in facial masks, although in some of its properties it is more effective than many other varieties. Yellow clay is rich in sulfur, sodium, iron, potassium. It enhances the metabolism in the skin cells, enriches them with oxygen, as a result, the skin acquires a beautiful, healthy color. As a result, yellow clay is suitable for dull skin prone to rashes, pigmentation, with reduced elasticity. It perfectly treats acne and other skin inflammations, awakens to life, tones faded, tired skin and gives it a healthy, beautiful, natural color. Another variety of cosmetic clay, undeservedly forgotten and little used is gray clay. If you see a bag of gray clay in a drugstore, be sure to purchase it – you will not regret. Its specialty is active moisturizing of the skin. This is the rare type of clay that is appropriate to use for on sensitive, weathered skin. It is extracted from the seabed, therefore it is rich in useful and active substances that will nourish the skin of any type equally well and efficiently. So, these are the main varieties of cosmetic clay that can be used in homemade masks. Determine the problem you want to solve: oiliness or dryness of the skin, cleansing or getting rid of acne, rejuvenation, or you just need a refreshing effect. And after that, choose the color of your clay. The preparation and application of masks with clay on the face is simple and similar to the use of any other masks. Choosing masks with cosmetic clay, be sure to look closely at the other ingredients that make up its composition. If you eat eggs and honey without any fear, these same products applied to the skin can cause an allergic reaction. Therefore, be sure to pre-test your prepared products, putting them on the skin of the wrist. And one more not less important nuance: if there are any serious problems (purulent inflammation, open wounds, fungal skin diseases), it is better to first consult a dermatologist. Do not dilute the powder in hot water: it must be boiled but cooled to room temperature. If the prepared mixture turns out too liquid, add another dash of clay powder. If too thick, add water. Before applying the mask you need to steam the face (make a steam bath) and clean the skin with a scrub. Do not apply these products to the skin around the eyes (because of the possible drying effects of clay). In order to get a full relaxing experience, lie down to rest while having a mask. This is only 15–20 minutes. Wash off the mask with luke warm water. Do the masks twice a week. A full course of treatment with any cosmetic clay is 10 masks, after which it is recommended to take a break of 2-3 weeks. Do not use clay if you suffer from the thyroid gland diseases. If you have varicose veins and hypertension, anti-cellulite mud wraps should not be performed. There are no medical contraindications for the use of clay face masks, since they are based on clay – a natural substance that does not cause allergic reactions. To maximize the result after applying the mask, consider some of the nuances of its use: pay attention to the other ingredients that make up the mask, whether you have an individual intolerance to these components. Like all other masks, a clay face mask should not be used more than 2-3 times a week to avoid excessive dehydration of the skin. For dry skin, the procedure duration is 5-7 minutes, normal skin – 10 minutes, oily skin – 15 minutes. Hence, people with dry skin can make a clay face mask no more than once a week, and those who have oily skin once every 4-5 days. Clay masks are recommended to use as a course, every 2 days, up to 10-15 procedures for one course. Other components can be added to the clay mask to provide a complex effect on the skin.